Amanda Waller, director of Task Force X, has hand-picked the members of her Suicide Squad to handle any dirty job she throws their way. This time, however, what she wants belongs to one of Superman’s deadliest antagonists—and getting it is more important than ever. With a sprawling international conspiracy threatening to destroy everything she has built, the Wall must go toe-to-toe with none other than Lex Luthor to secure the key to controlling the living weapon of mass destruction known as General Zod. But no matter what power Waller may hold over him, Zod kneels to no one, and it’s not long before he and the rest of Task Force X are at each other’s throats. 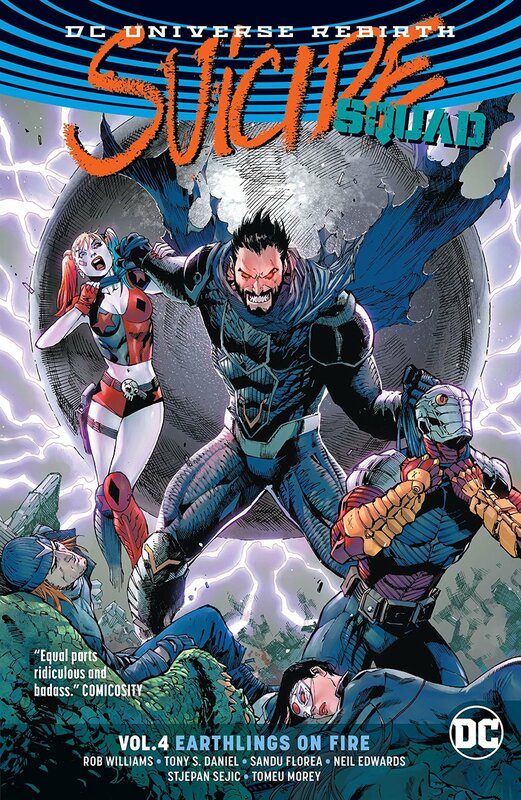 Will Waller’s plan to make this Kryptonian war criminal a full-fledged member of the Suicide Squad live up to its enormous potential? Or will it actually doom the entire planet to devastation and alien enslavement? The answer may surprise you! Superstar artist Tony S. Daniel (BATMAN: R.I.P.) joins acclaimed writer Rob Williams and guest artists Neil Edwards and Stjepan Sejic for SUICIDE SQUAD VOL. 4: EARTHLINGS ON FIRE—an all-out action spectacular featuring an entire platoon of Superman’s greatest enemies!